Cost to seed a lawn varies greatly by region (and even by zip code). Get free estimates from local contractors in your city. Cost to seed a lawn varies greatly by region (and even by zip code). Seeding your lawn costs approximately $0.05 per sq.ft. How much does it cost to seed a lawn? Lawn seeding is the process of adding new grass to your lawn through seeds. This is in contrast to adding grass to your lawn through sod or other forms of fully mature grass. Seeding your lawn can help keep it healthy, improving its looks and coverage. Seed can be applied to thin, sparse areas of your lawn to help fill it in, or you can use seed to start a brand new lawn, such as in areas of new construction or recently cleared areas. There are several different ways that you can seed your lawn, as well as different types of seed, which can impact the final cost of adding seed to your lawn. The size of your lawn and what type of prep work may need to be done to get it ready for the seed can also have an affect on the final cost. Most homeowners spend between $250 and $850 on lawn seeding a 5,000 sq.ft lawn, depending on whether they are seeding an existing lawn or starting a new one. Growing your lawn from seed is time consuming, and dependant on several factors such as weather, sun, and water. This means that if you are starting a new lawn from a cleared area, it may be several weeks to months before you get some results, and about two years before you get a fully filled in and lush lawn. Therefore some homeowners who wish to speed up the process may turn to sod to help their lawn get results faster. Sodding your lawn is the process of transplanted already developed grass and roots onto your property. The grass is already growing, and the roots only need to be able to reach the soil below to take hold and form a healthy lawn. This gives you instant results from a visibility standpoint, although sod can still be impacted by pressure, sun, and moisture. The biggest advantage to using seed over sod is the cost. Seeding your lawn costs approximately $0.05 a sq.ft, while sod will cost you $0.40 to $0.70 a sq.ft. Assuming a 5,000 sq.ft. lawn, this is significant cost difference, with seed costing only $250 and sod installation running around $2,000 to $3,500. Homeowners turn to seeding for different reasons. In some cases, you may have an established lawn that has thin areas, areas of grass that has died, or areas that you want to improve the quality of. Seeding this type of lawn is known as renovation, and costs around $80 to $300. Typically, the seeding in a renovation involves spreading the seed, mowing the existing grass, occasionally cutting out areas of dead sod, as well as raking, aerating, and fertilizing the new seed. Renovation of your lawn through seeding can take two to eight hours depending on the size of your lawn, and the amount of seeding that needs to be done. Keep in mind that if you have a lot of dead sod to be cut and removed, this will add an additional $2 per sq.ft. to your total costs. If your lawn is in truly bad condition, and you need to start from scratch, or you’re adding seed to a newly cleared area such as new construction or after the removal of trees, this can be significantly more work. Known as a lawn replacement, this method typically costs between $400 and $800, and usually involves spreading the seed and raking. If you have a current lawn that is dead and that requires the removal of the old grass before the application of new seed, you can expect to pay significantly more - up to $6,500 for the removal of the old grass and the installation of the new seed for a 5,000 sq.ft. lawn. Keep in mind that the size of your lawn will have a big impact on the total costs of seeding. Smaller lawns or seeding of small areas of a lawn can cost a lot less than seeding a larger area. Prior to adding new seed to your lawn, your soil may need to be prepared to accept the new seed. What type of work you will need to have done will be largely dependant on the condition of the area. 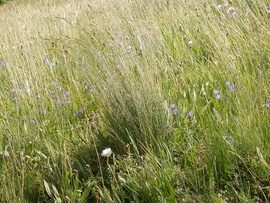 For areas with existing grass, the area may require mowing, as well as removal of old or dead grass. For all areas, the soil itself may require fertilizer or herbicides to help protect the new seed and help it grow. The soil may also need to be aerated or turned to help improve quality or it may need to be raked. These types of preparation are usually included in the cost of the seed application, but may increase the cost of the total job by up to $2 per sq. ft for areas with particularly poor soil quality or in areas with that need a lot of old grass or weeds removed first. There are hundreds of different types of grass seed available, all with distinct characteristics and costs. If you are seeding an area of an existing lawn, you may need to have your existing grass tested or identified to determine its type before applying new seed to get the best match. If you are seeding a new lawn, be sure to research what types of seeds grow best in your climate and in your soil. Having your soil tested can also tell you what type of grass may grow best there. Matching the type of seed you use to your area and soil will help ensure that your new lawn grows in healthy and withstands your climate. Fescue 1 Cool seasons, shady areas, Northern US and Canada $65 for 25 pounds or 5,000 sq. ft.
Bermuda Warm seasons, sunny areas, Southern US $100 for 25 pounds or 5,000 sq. ft.
Kentucky Bluegrass Cool seasons, most of US $98.50 for 25 pounds or 5,000 sq. ft.
Bahia Warm season, very Southern US $105 for 25 pounds or 5,000 sq. ft.
Clover Areas with poor soil nutrients that need improving prior to grass seed planting $30 for 5 pounds or 1,000 sq.ft. The amount of labor that it will take to seed your lawn, and the total costs will depend in large part on several factors including the total size of the area being seeded, the condition of the lawn and soil, and the type and amount of seed you’re spreading. These tasks typically cost between $150 to $700 depending on the amount of work and the size of the lawn. If your lawn is in relatively good shape, but has a few bare spots with nothing growing there, these can be reseeded at a cost of around $80 to $150. Fertilizer may be included in the seeding process if your grass requires it to grow, expect to pay another $50 to $80 to fertilize. For very large acreage, a tractor may be required to spread the seed, which can help keep labor costs down. The most common time of year to seed your lawn is in the fall. The warm days and cool nights encourage root growth so your lawn has time to fill in before the next summer’s heat. If you have an existing lawn, you may find that repairing or renovating it is much less expensive than completely reseeding the entire lawn. This may include a mixture of fertilizing and amending the soil as well as adding seed to help recover the grass that is already there. 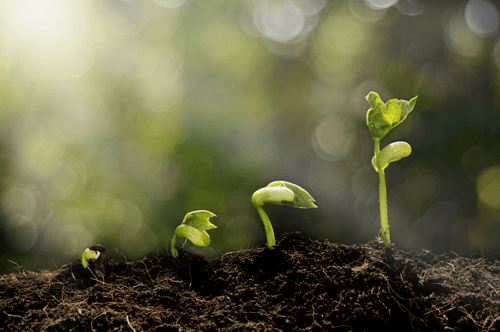 New seed requires a lot of water to help it grow in the initial months. 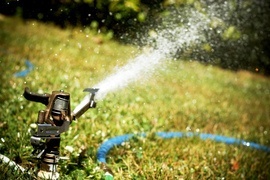 Consider adding a sprinkler system 2 at a cost of $2,500 to $3,500 to your lawn to help make it easier to water. Hydroseeding is an option that can help encourage new growth; water, seeds, and fertilizer are mixed together and spread over the lawn at once. This can add an additional $.02 a sq.ft. to the total costs. Grass seed requires more maintenance than sod because the seed needs to put down roots. During this time you will need to water frequently, fertilize regularly, and consider using an herbicide to prevent weeds from growing with the seeds. If you have many acres to seed, you may need to order your seed by the truckload to be delivered. There may be an additional charge for this; smaller bags of seed are usually included in labor costs. If your soil is extremely rocky, you may need to pay additional fees for rock and stone removal and disposal. This may add an additional $200 to $400 to your total costs. How much does it cost to seed a lawn in my city? Cost to seed a lawn varies greatly by region (and even by zip code). To get free estimates from local contractors, please indicate yours. A summary with the cost of the project has been added to help the user find this information faster. An image has been added for a better understanding of the project.